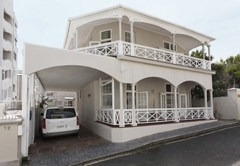 Enchanted Guest House is a 3 star graded guest house offering Bantry Bay accommodation in 8 guest rooms. 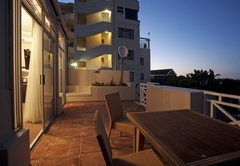 Enchanted Guest house is located in the heart of Bantry Bay where sea, mountain and city are exquisitely blended. We are a minute walk away from Saunders Rock Beach on the Atlantic Sea Board of Cape Town and we also have Lions head protecting us from the South Easter when it blows. 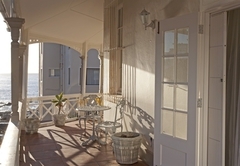 This Victorian home has a calm and peaceful atmosphere “home away from home feeling”, with a modern approach to hospitality and friendly staff. 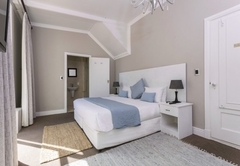 We have eight elegantly furnished bedrooms which are spacious and most with a private patio or balcony with captivating sea or mountain views. Our Guesthouse and the outside area with plunge pool and braai facilities are the perfect place to relax and rejuvenate. 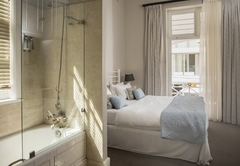 All our rooms are fully equipped with en-suite shower, air-conditioning unit, comfortable beds, modern flat screen TV’s, hairdryers, coffee/tea station, a mini fridge and a safe. We provide our guests with pool/beach towels on request as well as airport transfers and guided tours. 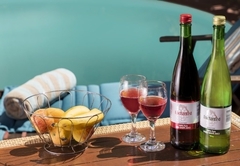 As complimentary every guest has free wireless Internet Access. Our breakfast buffet is served from 8h00 to 10h00 and on the weekend until 11h00. We serve a variety of cheeses, fresh fruits, cereals, yogurts, spreads, fresh juices and a scrumptious warm breakfast which includes eggs (scrambled, fried, poached or boiled, Macon, Vienna’s and mushrooms). You should try our “Enchanted Omelets” for which our guests love us. Every day we add something different to the menu, from flapjacks to pan cakes and pastries. 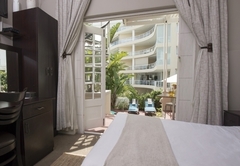 Airconditioned spacious luxury bedroom with king size bed and en-suite bathroom shower only. Sea and mountain views from balcony. Flatscreen satellite TV, tea/coffee, hair dryer, safe, and mini fridge. Free wi-fi in the entire house. 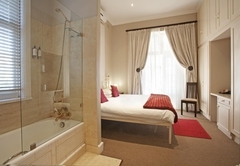 Airconditioned spacious luxury bedroom with king size bed and en-suite bathroom with bath and shower. Sea and mountain views from balcony. Flatscreen satellite TV, tea/coffee, hair dryer, safe and mini fridge. Free wi-fi in the entire house. 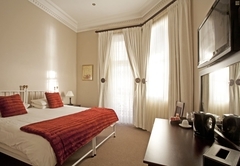 Airconditioned spacious luxury bedroom with king size bed and en-suite bathroom with shower only. Sea and mountain views from balcony. Flatscreen satellite TV, tea/coffee, hair dryer, safe and mini fridge. Free wi-fi in the entire house. 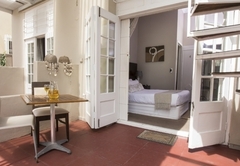 Airconditioned cosy bedroom with king size bed and en-suite shower.No balcony or sea view. Flatscreen satellite TV, tea/coffee, hair dryer, safe and mini fridge. Free wi-fi in the entire house. Airconditioned standard bedroom with queen size bed and en-suite shower. 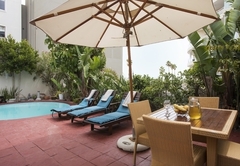 Access to furnished patio and pool area. Flatscreen satellite TV, tea/coffee, hair dryer, safe and mini fridge. Free wi-fi in the entire house. 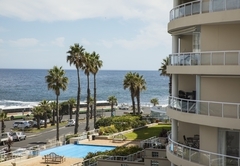 1 Review from SA-Venues.com travellers. All reviews are verified. it was a truely wonderful experience.Derrick and his staff are extremely competent and accomodating.This establishment has a five star quality and I would not hesitate to recommend this B & B to friends and international travellers. Response timeEnchanted Guest House typically responds to requests in 5-10 minutes. Exceptions to check-in times may be arranged, please enquire.